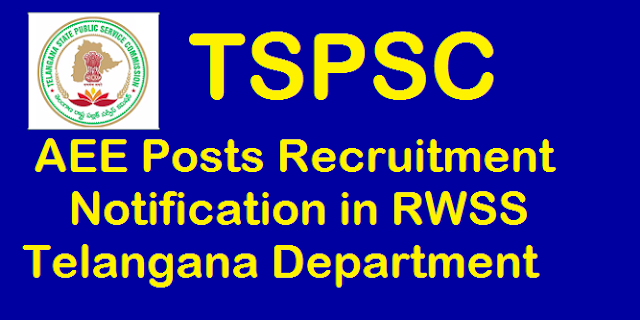 Telangana Public Service Commission Notification is out for Assistant Excutive Engineer 277 Posts in Telangana Rural Water Supply and Sanitation Department Schedule for Online Application Educational Qualifications Scheme of Examination Recruitment Exam Dates Download of Hall Tickets Answer Key Result Schedule will be mentioned in Detailed Notification by TSPSC. Recruitment Notifications in Telangana are going on. Sl.No. Name of the Post Educational Qualifications as specified by the Department of RWS&S vide G.O.Ms.No.75, Panchayat Raj and Rural Development (Estt.-III) Department, Dt.06/04/2011. 1 Assistant Executive Engineers (Civil) RWS&S Department Must possess a Bachelor Degree in Civil Engineering of a University in India established or incorporated by or under a Central Act, Provincial Act or a State Act or an Institution recognized by the University Grants Commission or a pass in Sec. A & B of AMIE Examination conducted by Institute of Engineers in Civil.